peek >> << backSouth side of Tingey Street between 3rd and 4th, May 2004. March 7, 2016 - Arris, completed in March 2016, as seen from the south at 4th and Water Streets, SE. Construction got underway in early 2014 on the 327-unit building, designed by Robert A.M. Stern Architects. The building also has about 20,000 square feet of ground-floor retail. March 7, 2016 - An opposite view, from 4th and Tingey, with the reflective glass of the upper floors coming close to fading into the matching sky. 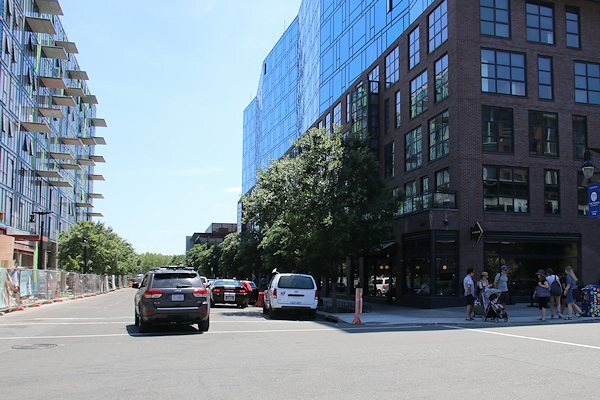 The old 4th and Tingey intersection was a barren, fenced-off vista, showing mainly the pre-renovated Lumber Shed and Foundry Lofts, but now Arris towers above. Dec. 10, 2017 - Arris's newest retail offering, Willow, arrived on Water Street in November, 2017. Oct. 22, 2017 - Restaurant Chloe, Arris's first sit-down full-service restaurant, looks to be opening in early 2018. Aug. 5, 2017 - Cosmopolitan Nail Salon opened in 2017, and there was much rejoicing. Aug. 5, 2017 - Conte's Bike Shop. Aug. 5, 2017 - The Juice Laundry, serving healthy offerings since summer 2017. April 16, 2016 - Looking upward at the building's southern end, showing the overhang where the glass tower begins. June 9, 2016 - A look at the building's west side, where three eight-story all-brick structures surround two private courtyards. March 7, 2016 - The residents' lobby, seen as part of a photo tour of the building in early March 2016. March 7, 2016 - The living room of the model two-bedroom unit, seen as part of a photo tour of the building in early March 2016. March 7, 2016 - The kitchen of the model one-bedroom unit, seen as part of a photo tour of the building in early March 2016. March 7, 2016 - The residents' first-floor lounge area. March 7, 2016 - The lobby, with furniture still to come, and the north courtyard. March 7, 2016 - The roof deck, with the weather not quite yet pool-worthy, seen as part of a photo tour of the building in early March 2016. Oct. 11, 2015 - A more far away view showing the Arris construction from the Diamond Teague Park. 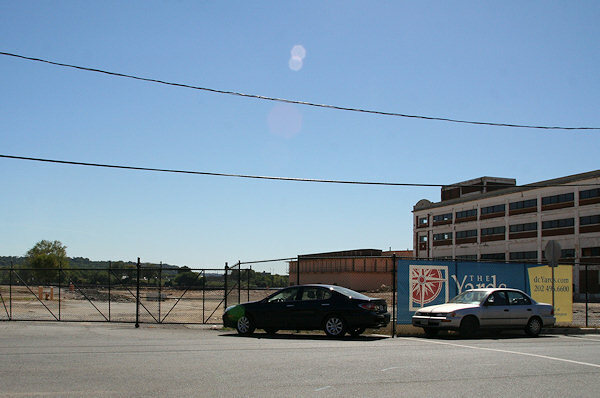 May 21, 2004 - A decade-old photo of the Parcel N lot, looking south from Tingey west of 4th Street, in May 2004. The retro versions of the Foundry Lofts and Lumber Shed are at right. June 9, 2016 - The same location, now Arris'ed. Note first retail tenant Philz Coffee at right.